Oooh super shot! Love the contrasting tones and fine composition. The details are excellent and you have presented this very well my friend! Great job Barbara! PS congrats on your well deserved award! Rohan please limit your critiques to one or two per image, this is not a chat room. Thank you for your cooperation. Yes, the colors were fading, but I emphasized that some in the post. Well, close. 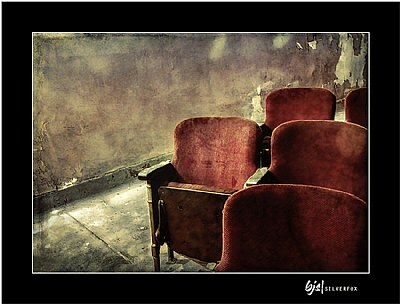 A theater awaiting restoration. So currently in disrepair but expecting to be in full old time glory some time soon....I too find elegance and nostalgia in these places and never tire of shooting in such spaces. I guess composition, like other elements, are very much a matter of taste. I am not sure why I do like the comp (obviously) but I really do. I certainly have others and will be posting them from time to time. Let me know what you think. Abandoned theatre perhaps?I spent the afternoon in an abandoned summer disco that has been severely trashed but I find a certain elegance and nostalgia there and in such places as you probably know if you have seen py portfolio..I am a bit puzzled by the composition in your photo,it really doesn’t work for me.Maybe you will post some more shots of this place...hope so! Fine capture. Even the colors looks old. THANK YOU for your welcome comment, Art. Much appreciated. ,. one of the best seats in the house ,. ( stretch your legs :) fine take,.